Ideal for yoga teachers & complete yoga newbies! Level One: Basics uses the simple sun salutation sequences, Siddha breathing techniques, potent Siddha mantras and other empowering yogic tools to awaken the mastery of consciousness. The very nature of consciousness is the abundance of health, wealth, and wisdom. Attain the blessings of our highest Self and be the Yogi! The gift of grace comes from having a daily discipline to attain higher consciousness, health, abundance and love. Yoga naturally yields all attributes of yogam (luck). These are precious moments for humanity, as higher consciousness is now a reality. Yoga, in the Western sense, spearheads this awakening, even if it is considered a simple exercise for health benefits and fashion, instead of spiritual discipline; the taste of a drop of honey will eventually lead to the honeypot of higher consciousness. 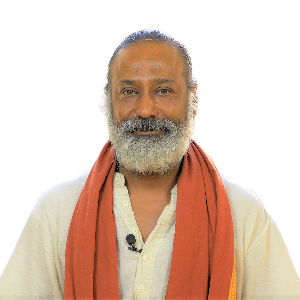 The Siddhar wisdom is potent when applied to the practice of Yoga, as the body is an effective tool to lead the mind towards the inner core of realization. By Yoga, we refer to Hatha Yoga as practiced in the West: the sequence of physical postures and the inner journey created through this practice. I recommend utilizing the traditional Sun Salutation sequence to experience the teachings below.